If you’re like many people, you use your range frequently, perhaps several times each day. Nevertheless, the range can be one of the most endurable major appliances if cared for properly helping you to avoid range repairs. Because there are so many types of ranges (electric coil element, electric smooth top, gas sealed, gas unsealed, dual fuel, etc. ), be sure to consult the manufacturer’s instructions to make sure you are taking the proper steps and using approved cleaning methods and materials. 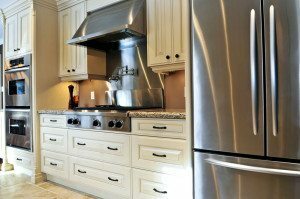 Here are a few general maintenance tips that may help your stove hang around for many more meals. Note: Before beginning any type of cleaning or maintenance on your range or stove, ensure that all burners are turned off and it is cool to the touch. It is critical to never use abrasive cleansers on your range’s control panel. Otherwise, you will quickly and completely remove the lettering that tells you what’s what. Never spray a cleaning product directly on the control panel; rather, spray some on a soft cloth or sponge and lightly wipe the surface of the panel. You can use the same approach for the knobs, although some knobs do come off so you can soak them in warm water and a gentle cleaning solution to remove built-up dirt and grime. If you have a stove with the bowl-style drip pans beneath the burners, those drip pans are likely to become permanently stained at some point. Replace drip pans every two to three years. This may also apply to the panel below your electric oven’s bottom heating element. 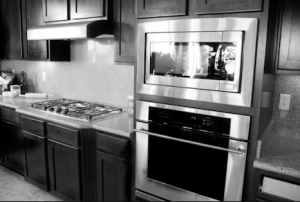 Typically, smooth surface cooktops are made of glass. The only way to safely and effectively clean these surfaces is with a product made specifically for cleaning glass cooktops. Often these same products can be used for cleaning the glass portion of your oven door, but be sure to check your manufacturer’s recommendations. While cleaning your oven door, be sure to clean the thermal gasket and check for damage or separation. Most ovens take a standard 40 watt appliance bulb. It may be exposed or you may need to remove a dome or cover. If so, take this opportunity to clean the cover or dome by soaking it in warm water and white vinegar for 15 minutes to help loosen baked on grease. Use a soft sponge and dish soap to remove any remaining residue. Be sure to dry the bulb cover thoroughly before replacing it. By following these basic care instructions, you can help your range stay on top of its game. 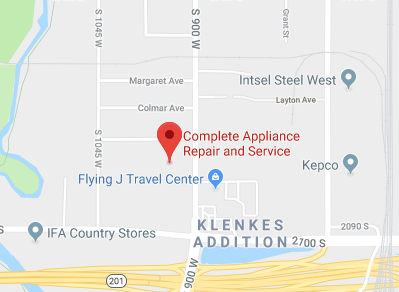 If you have problems with your stove, contact us at Complete Appliance Repair and Service to come out and take a look. There are many aspects of the range that should not be serviced by anyone other than a professional. This entry was posted in Blog and tagged oven maintenance, Range hood maintenance, Range Top and Oven Maintenance on April 21, 2014 by admin.